The name of allowance is pretty self-explanatory itself, but still I’d like to offer an explanation. To help its gazetted officers administer their cities more effectively Central Government started reimbursing the purchase of newspaper on their residences in form of this allowance. It was an awesome addition to the salary of those employees, but that’s not the best thing about it. The best thing is something else. You want to know what it is? Then keep reading. And finally, 15% of the bill amount is deducted while making the payment. You may revert this deduction by returning old newspapers, but if you decide to keep them then this deduction will be done. Other rules (especially the limits of allowance) vary among ministries. You should check them with your department. Another rule regarding this allowance in Railways is that officers who claim it can’t subscribe to a newspaper in their office. 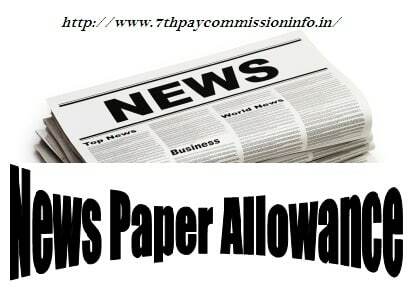 Aside from employees of Railways Gazetted officers in almost all other departments of Central Government are also eligible for newspaper allowance. And there’s a reason for it – when officers come armed with information from their homes, they can start execution as soon as they reach their offices. Newspaper Allowance Taxable or Not? Now this is the best thing we talked about in 1st section – newspaper allowance is tax free. It’s tax free because it’s a reimbursement, which mean no addition to the income because amount paid by government to the employee equals to the amount spent by him on the expense for which it has been paid. As long as you get less than Rs. 12,000 per annum as Newspaper allowance, it’ll be exempt from taxes. Needless to say that it’s more than enough to purchase as many as five Indian newspapers everyday. 7th CPC has recommended the government to increase this allowance by 25%. Moreover, the commission has also recommended that entire lump sum amount should be paid to employees without the need of producing bills. While these changes are good news in general, they’ll come with their own limitation. Until now newspaper allowance was tax free, but now when it’ll be paid as a fixed sum it’ll be taxable because it won’t remain a reimbursement anymore. This has already been seen in some ministries where this allowance is currently paid as fixed sum. There’s no reason for government to change it.